With the capture of Betio, three things remained to be done: (1) The capture of the rest of the islands in Tarawa atoll; (2) the capture of Apamama atoll; and (3) the capture of Abaiang, Marakei, and Maiana atolls. The first of these was assigned to the 2d Battalion, 6th Marines, commanded by Lt. Col. Raymond L. Murray. This battalion started its long march up the atoll from Buota on 24 November. Even before that, however, some preliminary reconnaissance work had been done on the little islets east of Betio, in the area of the base of the long axis of the L-shaped atoll, by Company D, 2d Tank Battalion. This company, commanded by Capt. John R. Nelson, was the division's scout company, and while the battle raged on Betio, it was assigned the mission of reconnoitering Eita, Buota, and the little unnamed islets to the north of those two. On 21 November the 3d Platoon landed on Eita, where it found fuel dumps, bomb and mine dumps, but no Japanese. 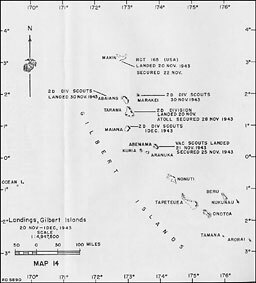 The 2d Platoon landed on Buota, the islet that makes the bend at the elbow of the atoll, and located a Japanese position, estimated to contain 100 of the enemy, and a radio station at the corner of the bend. 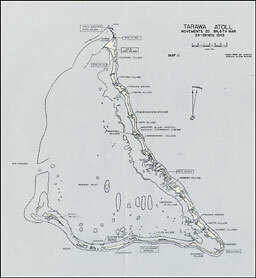 The 1st Platoon landed about 4 miles farther up the atoll to the northwest near Tabiteuea village, where it captured one Japanese laborer and several natives. The 3d Battalion, 10th Marines, was sent to Eita on 23 November, and the 3d Platoon, Company D, was attached to the artillery battalion. The platoon had captured one Japanese prisoner. Just after dark of that same day the Japanese force on Buota moved north through the positions of the 1st Platoon, Company D. Next day, the 1st and 4th Platoons scouted as far north as the island called Ida, about halfway up the long side of the atoll. In the meantime, Nelson met the 2d Battalion, 6th Marines, on Buota and guided the battalion as far north as Julia. 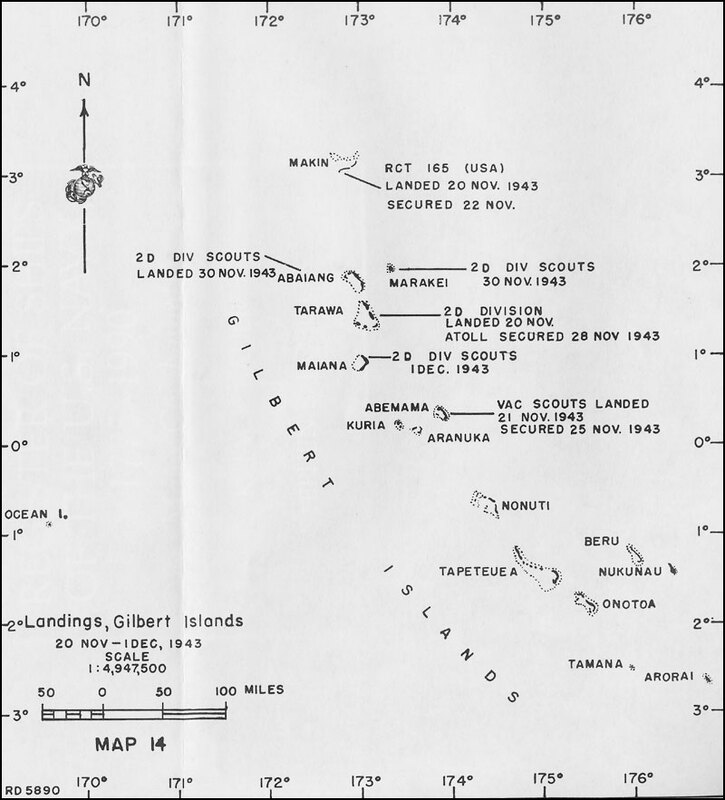 On the following day the scouts were recalled to Eita to prepare for reconnaissance missions on the atolls adjacent to Tarawa--Abaiana, Marakei and Maiana. As mentioned before, the 2d Battalion, 6th Marines, was assigned the mission of cleaning up the rest of Tarawa atoll. This battalion had seen little action during the fight for Betio and had suffered fewer casualties than any of the other battalions. Murray's battalion embarked in boats from Betio at 0500, 24 November, and moved over to Buota to begin the trek to the north. By nightfall the battalion had advanced to Buoti,1 passing through several native villages recently evacuated; no enemy force was contacted. The march was resumed on 25 November and at the end of the day the battalion was well up the atoll. Still no contact with the enemy had been made. 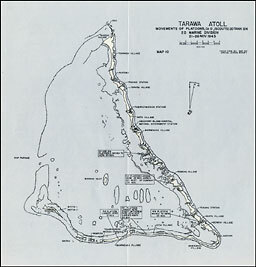 By late afternoon of 26 November, the 2d Battalion, 6th Marines, had reached the south end of the last large island at the northwest end of Tarawa atoll--Buariki. Before bivouacking for the night, Murray sent out Company E to the northwest to maintain position as an advance covering force. Murray knew from information received from the scouts that somewhere north of him there were at least 100 Japanese; the enemy group had to be on Buariki. ran into a Japanese patrol at sunset. A brief fire fight ensued, in which two Marines were wounded, and it was believed that two or three Japanese were killed. After dark, Company E's patrols returned and the company remained in its defensive position during the night. Occasional harassing enemy rifle fire was received, but the Marines held their fire and waited for daylight. There were no additional Marine casualties. Next morning Murray advanced with two companies in assault and one in reserve, to clear the area between his position of the night before and the place where the island narrows northeast of Buariki village. Shortly after moving out the company found the enemy position. Although the Japanese had no organized line, it was difficult to destroy them. Broken into small groups, each of which was in a pit or behind coconut logs, the enemy held their fire until the Marines were almost on top of them. Vegetation was dense and the fighting was at close range. Company E was hit hard and paused to reorganize. Murray then moved Company F through Company E to continue the attack. In the meantime Company G was coming in on the enemy's east flank, attacking to the northwest. Murray had with him one artillery battery, Battery G, 10th Marines, but the action was at such close range as to make it impossible to use the howitzers except for one concentration which was fired when Company F passed through Company E.
After several hours of typical jungle fighting, the main enemy resistance was overcome, and Murray turned to mopping-up and patrolling. The day's action cost 3 officers killed and 1 wounded; enlisted losses amounted to 29 killed and 58 wounded. One hundred and seventy-five Japanese were killed and two Korean laborers captured. One tiny islet remained to be taken, Naa, or Lone Tree islet, which lay a hundred yards northwest of Buariki. Early in the morning of 28 November, Murray sent troops over to Naa, which was found to contain no Japanese, and by 0800 the capture of Tarawa atoll was complete. The 2d Battalion, 6th Marines, then returned to Eita to rest and reorganize after the long march up the atoll. On 22 October 1943, Maj. Gen. Holland M. Smith, commanding the V Amphibious Corps, ordered Capt. 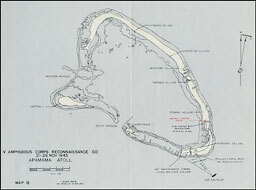 James L. Jones, commanding V Amphibious Corps Reconnaissance Company, to land his company (less one platoon) on Apamama during the night 19-20 November with the mission of reconnoitering the atoll in order to determine whether there was any sizable Japanese force ashore, and to select and mark suitable beaches and channels to be used later by other forces. If any large hostile force was present on Apamama, Jones was to withdraw and avoid an engagement. Jones' company was to be lifted to Apamama on the submarine Nautilus. 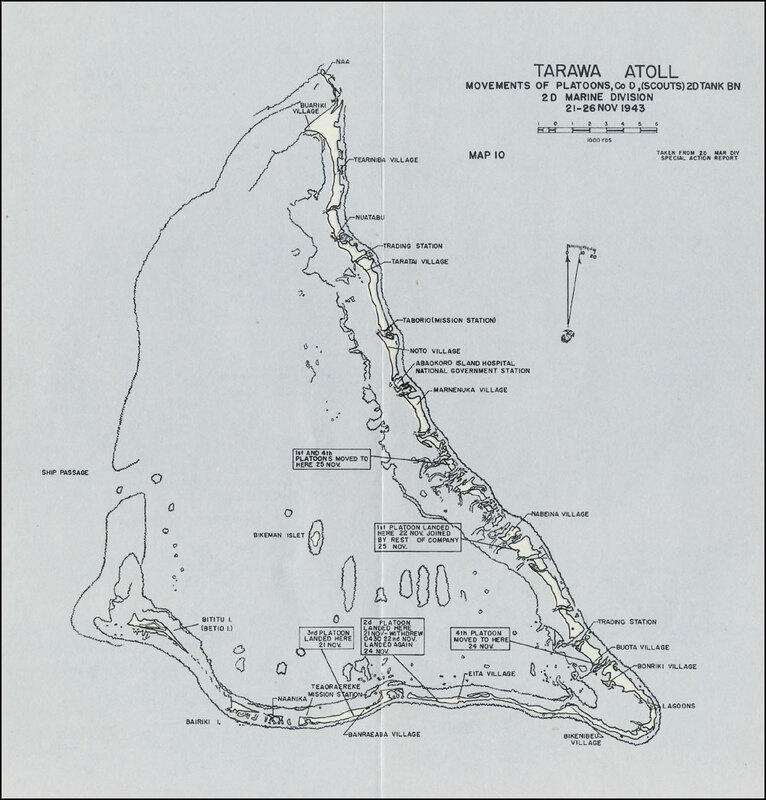 Apamama atoll (also called Hopper atoll, Abemama, and Apemama) lies 76 miles south of Tarawa. Elliptical Apamama has its lagoon almost entirely enclosed by Abemama Island, a long island that is is broken in five places so that it appears that there are six islands closely joined together. Across the southwestern side of the atoll there is a reef, through which are two passages suitable for small ships. The southwestern side of the atoll is guarded by two islands separate from Abemama, called Abatiku and Entrance Islands. To avoid confusion, the six portions of Abemama were given code names (as were the islands of Tarawa atoll). The north segment was named STEVE; next OSCAR, then OTTO, ORSON, JOHN, and finally JOE. Entrance Island was named NICK and Abatiku was called MATT. The whole atoll is about 12 miles long and 5 miles wide. Surrounding it, broken only by South Passage and Western Passage, is a continuous reef. Inside the lagoon there is considerable foul ground and coral heads. Coconut palms and tropical vegetation are found in abundance on all islands of the atoll. In addition to her mission of carrying the corps scouts to Apamama, Nautilus had another mission to execute first. From Pearl Harbor the ship was to go to Tarawa, to cruise in that area prior to the landing on Betio in order to observe Japanese movements and positions, and to be available to rescue pilots of the attacking planes if any were shot down during the pre-D-day "softening-up" process. Nautilus was to leave Tarawa on 19 November in order to land the scouts on Apamama. to make better time. A few minutes after 2100, 19 November, a destroyer from Task Force 53, now approaching Tarawa, opened fire on Nautilus under the impression that the submarine was an enemy craft. One direct hit with a 5-inch shell was scored on the main induction tube. Immediate emergency measures righted the ship after she had dived to a depth of about 300 feet, and several hours later she was able to surface and effect temporary repairs to the damage. All next day the ship had to remain submerged, arriving off Apamama at about 1400. After sundown a run was made to the south to provide an opportunity to charge batteries; then the submarine returned to Apamama to discharge the corps scouts in their rubber boats. Long before dawn in the morning of 21 November, Jones' company left the submarine and headed toward JOHN Island. A strong current caused the boats to drift off course and the company landed on JOE instead of JOHN. Once ashore, the scouts began patrolling and had one minor brush with the enemy when a three-man patrol was encountered. One Japanese was killed. The company then moved to the next islet, ORSON. Here natives reported that there were 25 Japanese on Apamama and that their positions were just across from the north end of ORSON on the south end of OTTO. Attempts to cross the sandspit connecting ORSON and OTTO were unsuccessful; the Japanese, strongly entrenched in fortified positions, laid down a heavy volume of fire from light machine guns and rifles. Since it was now late in the day, Jones broke off the action and withdrew to plan for the next day's attack. It appeared that without mortars, it would be impossible to dislodge the Japanese from their positions. On the morning of 24 November, Jones moved his platoons to the north end of ORSON and called in 70 rounds of fire from Nautilus on the Japanese positions. The enemy continued to fire while the submarine was firing and Jones was unable to use rubber boats to outflank the Japanese. Late in the day a destroyer offered her services and fired a few rounds as it grew dark. Next morning a native arrived at Jones' camp with the news that the Japanese were all dead. This information was corroborated by another native who had given reliable information before. The 1st and 3d Platoons were sent to investigate and found that the story was true. A few of the enemy had been killed by the shelling and the rest, about 18, had committed hari-kari. On the following morning a landing force commanded by Brig. Gen. Leo D. Hermle arrived to occupy Apamama. With the arrival of the 3d Battalion, 6th Marines, Jones received orders to embark his company aboard the Harris and depart the atoll. The V Amphibious Corps scouts had lost few men. One man was killed in action, one wounded in action, and one was injured. The enemy loss was complete: 23 dead. On 24 November 1943, Gen. Julian C. Smith directed Brig. 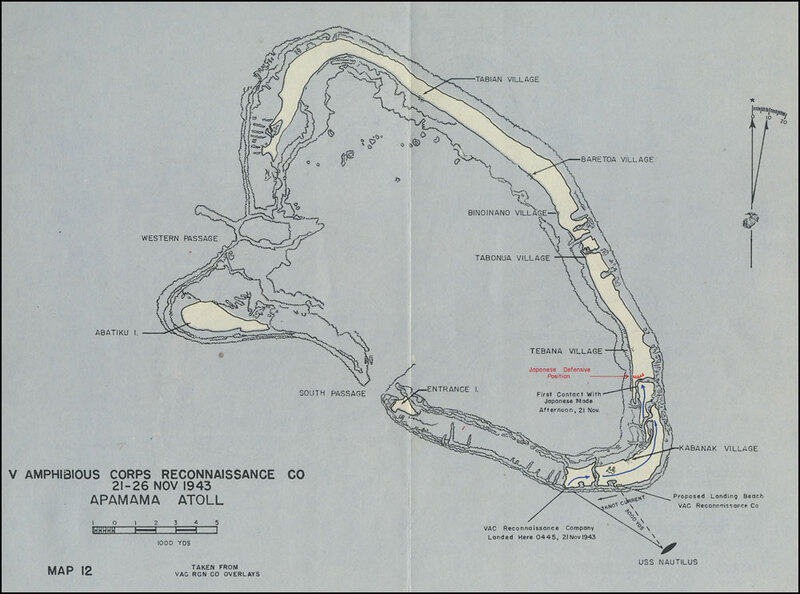 Gen. Leo D. Hermle to seize and occupy Apamama atoll. Hermle was to be in charge of a landing force built around the 3d Battalion, 6th Marines, commanded by Lt. Col. K.F. McLeod. Hermle was instructed that V Amphibious Corps Reconnaissance Company had secured two islands of the atoll and that there were about 25 Japanese holding out from fortified positions. Rear Adm. Harry Hill was to provide the naval task force necessary to lift Hermle's landing force to Apamama. At 1500, 25 November, General Hermle, aboard the Maryland with Admiral Hill, and the 3d Battalion, 6th Marines, on the Harris, left for Apamama. During the uneventful voyage to the target Admiral Hill received word from corps scouts that all the Japanese on Apamama were dead. Next morning the force arrived at Apamama and Lieutenant Colonel McLeod sent two of his rifle companies ashore, Company I on JOHN Island, and Company K on STEVE Island. General Hermle went ashore the morning of the same day to organize the atoll's defenses and to arrange for a meeting with native chiefs, during which he would acquaint them with his plans for occupying the atoll. On 1 December, Gen. Julian C. Smith arrived to inspect the progress of unloading supplies and equipment, and the atoll's defenses. In the meantime the 8th Defense Battalion had arrived and had emplaced its weapons. Also ashore was the air base commander. On 4 December, General Hermle received orders from Admiral Hill to pass the command of Apamama atoll to the base commander, Capt. W.P. Cogswell, USN. Hermle left the atoll that same day to rejoin the division. On 29 November, Company D, 2d Tank Battalion, embarked aboard the minesweeper Pursuit with the mission of reconnoitering three island atolls adjacent to Tarawa--Abaiang, Marakei, and Maiana. There was the possibility that Japanese coast watchers might still be on these islands. Before dawn on 30 November, Company D landed two rubber boatloads of men above and below the village of Koinawa in Abaiang atoll. Five Japanese on the island left immediately in a native boat and last were seen sailing across the lagoon. Natives were contacted ashore and arrangements were made with them to take care of the Japanese should they return. Next atoll to be reconnoitered was Marakei. here the Pursuit was greeted by several boats filled with natives; from them came information that there were no Japanese on the atoll. To make sure, four boatloads of scouts went ashore; there were no Japanese. After leaving food and medical supplies for the natives, the Pursuit turned back to Abaiang to pick up the scouts who had landed there earlier in the day. Bad surf conditions had prevented taking them off sooner. Next morning, 1 December, the scouts landed on Maiana, near the village of Bickerel. No Japanese were on Maiana and after a brief reconnaissance, the scouts returned to the Pursuit and were back in Tarawa lagoon by noon. 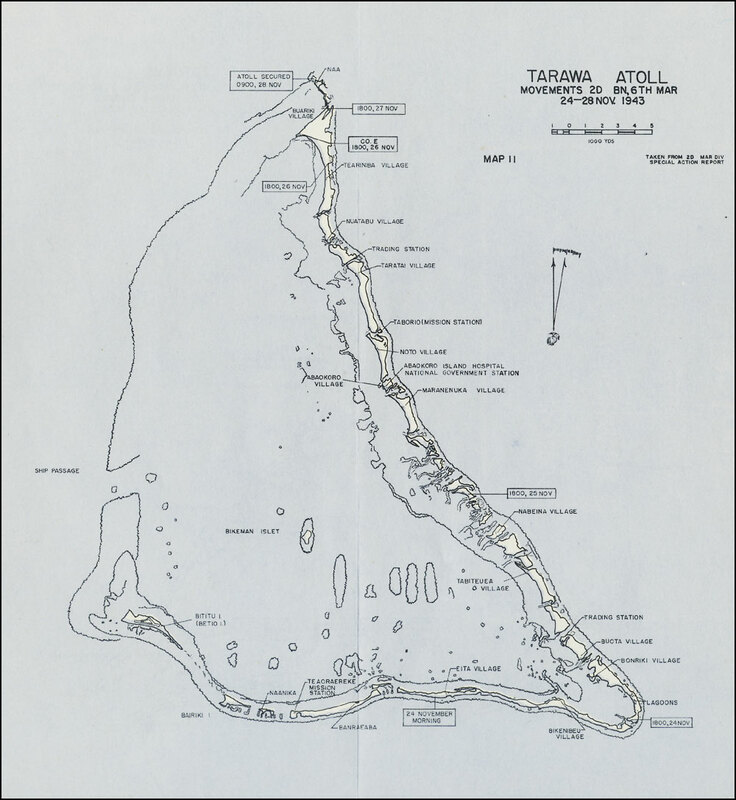 With the completion of the reconnaissance of Abaiang, Marakei, and Maiana atolls, and the arrival of defense battalions and other troops to garrison Tarawa and Apamama, the 2d Marine Division prepared to leave the Gilberts. The 2d and 8th Marines had left soon after the battle on Betio and were now in the division's new base camp at Kamuela, Hawaii. During the last week in November most of the remaining units of the division, except the 2d Battalion, 6th Marines, which stayed for two more months, embarked aboard ship and sailed for Hawaii. On 4 December, Gen. Julian C. Smith turned over the command of the Tarawa area to Commander, Advanced Base, Tarawa, Capt. Jackson R. Tate, USN. The cost of capturing Tarawa raised a storm of criticism in the United States when it was learned that the casualty figure amounted to roughly 3,000 killed, wounded, or missing in action. (See appendix B for a complete break-down). Too far removed from the realism of war, the American people were caught between shock and surprise; there was nothing to prepare them for the cost involved in making amphibious operations against a tenacious, fanatical foe who was willing to die to the last man for emperor and empire. For a while the hue and cry raised by the press almost obscured the facts. Subsequent amphibious operations in the Marianas, at Peleliu, and at Iwo Jima helped to give perspective to Tarawa, but by then the bloody, violent struggle was half-forgotten. Succeeding operations did much to dim the memory of Tarawa, but none ever obscured it; nothing could ever obscure such a battle where perseverance dominated over adversity, where individual courage and collective know-how defeated a strong Japanese garrison on its own ground and in its own positions. 1. Not to be confused with Buota, a separate island. 2. Time Magazine, 6 December 1943.